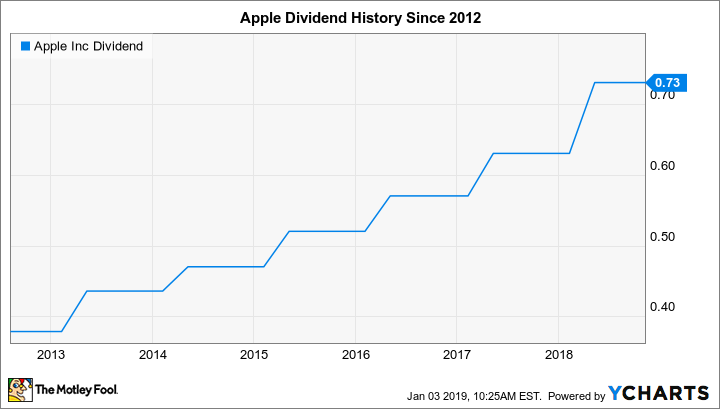 Will Apple Raise Its Dividend in 2019? Dividend growth has been a regular boon for the tech giant's shareholders. Will recent concerns change that? Apple (NASDAQ:AAPL) has seen a lot of controversy lately, falling from its former leadership position atop the list of stocks with the highest market capitalizations. With concerns that iPhone sales are starting to struggle, many investors fear that Apple's high-growth days are long behind it. Yet one often-overlooked aspect of Apple's success is how it's returned capital to shareholders. Despite spending billions on stock buybacks over the years, Apple has also been committed to regularly raising its dividend. After boosting its payout by 16% in 2018, Apple reached the seven-year mark in making consecutive annual dividend increases. But with business-related worries, will dividend increases stop for the foreseeable future? Let's look at Apple more closely to see what's in store for 2019. For most of its existence, Apple didn't pay a dividend. That was consistent with how tech companies usually worked, instead reinvesting available cash back into their businesses. After starting out with a modest payout, Apple discontinued its dividends in the mid-1990s to focus more on growth opportunities. By 2012, though, Apple had achieved huge success. In response to having so much cash on its balance sheet and free cash flow coming in, Apple started paying a dividend again. The tech giant set an initial yield of about 2%, with a payout ratio of about 30% of its earnings. In seven years, Apple's dividend yield hasn't really gone anywhere, but that's not for lack of trying. The stock has exploded higher, but the pace of the dividend increases that Apple has paid its shareholders has largely matched the stock's moves. Most of the company's hikes have been in the vicinity of 10% in recent years, but the most recent 16% boost marked an acceleration that stemmed in part from the positive future impact of tax reform. Is Apple's dividend in danger? Lately, investors have been in a near-panic about Apple's slowing revenue metrics. Just this past week, CEO Tim Cook warned that revenue would fall from year-ago levels to just $84 billion, with weakness in China and slower rates of upgrades among customers elsewhere weighing on sales. Yet Apple still expects to achieve record earnings results on a per-share basis, and the company's buyback spending remains strong. Even poor growth trends won't endanger Apple's cash flow, and a low payout ratio gives the iPhone maker latitude to boost dividends even if revenue challenges eventually lead to slower profit growth. Moreover, the fact that Apple has been so aggressive in buying back its stock means that it can afford to increase its per-share payout without having any impact on the actual amount of cash getting paid to shareholders. For instance, when Apple raised its dividend to $0.63 per share in 2017, it had about 5.2 billion shares outstanding, compared with roughly 4.8 billion shares in its most recent quarter. That's a nearly 8% drop, and so even though the per-share dividend payment is 16% higher, the total cash that Apple's spending on dividends is higher by only about 7% -- because it has fewer shares on which to make that higher payment. Despite worries, it's almost certain that Apple will continue to share its bounty with shareholders in the form of larger dividends in 2019. An increase to $0.80 per share quarterly near the middle of the year would be consistent with its old unofficial 10% target for past dividend hikes. That makes a good benchmark against which to measure whatever Apple chooses to do with its quarterly payout in the coming year.